One of the finest, and probably the most reliable, of the major annual showers presently observable. This is a splendid stream of often bright, medium-speed meteors, a rewarding event for all observers, whatever method they employ. The radiant, or centre of the stream rises at 22:11hrs AEDT, transits at 02:45hrs and sets at 07:20hrs. 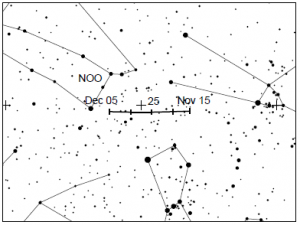 Start observing on the 13th, you maybe rewarded with a number of meteors. Origin: Using data from the IRAS satellite in 1983, Simon Green and John Davies discovered asteroid 1983 TB, now called 320 Phaeton. Although this object displays no cometary activity, its orbital match with the meteors suggests its parenthood of the Geminind streams.